Provides in-memory storage employing Least Recently Used (LRU) replacement policy. Definition at line 37 of file in-memory-storage-lru.hpp. Definition at line 26 of file in-memory-storage-lru.cpp. Definition at line 31 of file in-memory-storage-lru.cpp. Update the entry when the entry is returned by the find() function, update the last used time according to LRU. 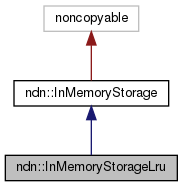 Definition at line 67 of file in-memory-storage-lru.cpp. Update the entry after a entry is successfully inserted, add it to the cleanupIndex. Definition at line 38 of file in-memory-storage-lru.cpp. Update the entry or other data structures before a entry is successfully erased, erase it from the cleanupIndex. Definition at line 59 of file in-memory-storage-lru.cpp. Definition at line 51 of file in-memory-storage-lru.hpp.